An archive is a file, which contains other files and their metadata. The advantages of an archive file are saved space and its portability. 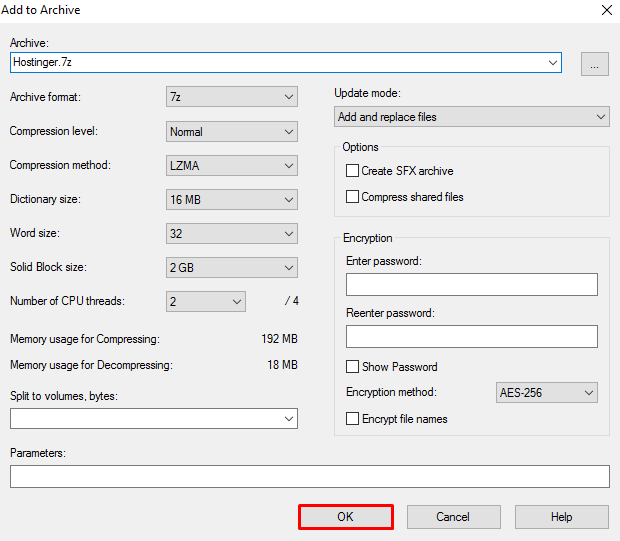 This tutorial shows you how to use 7-Zip in order to create an archive and how to uncompress it. Access the file(s) that you want to compress. Select them (you can select multiple files by holding SHIFT key) and hit Add. Archive: choose the name of your archive file. Archive format: choose the format of the archive. Available formats are 7z, XZ, BZIP2, GZIP, TAR, ZIP and WIM. 7zip (7z) is recommended due to its high compression rate. However, this format is has a low compatibility with other services. Compression level: choose how much you would like to compress the files. Compression time increases with compression level. The presets range from Store (fastest compression) to Ultra (slowest compression, most space saved). Split to volumes, bytes: you can split your archive into parts. This can be useful when transferring huge archives. For example, if you are trying to burn 2 GB of files to a CD, you can tell 7-Zip to split the archive every 650Mb. It will create several smaller archives. Single smaller archive will not exceed the specified size (in our situation 650MB). However, uncompressing the files will require all the smaller archives. Encryption: you can set a password for your archive. Then the files can be extracted with password only. For Compression method leave default LZMA option as it is considered to be the best. Once all your settings are set, click OK to create the archive. The archive file will appear in the same location as the original file(s). To uncompress the files, right-click on the archive and choose 7-Zip -> Extract Here option. Files will be extracted to the same directory as the original archive. Now you know how to use 7-Zip to compress and uncompress files. 7-Zip is a software for Windows OS; Linux users can use a command line version of 7-Zip called p7zip. The alternative for Mac users is keka.